It is encompassed by the Kara Sea, Laptev Sea, and East Siberian Sea, and respectively subdivided into the Kara Shelf, the Laptov Shelf and the East Siberian Shelf. Eastwards it merges into the Chukchi Shelf (of the Chukchi Sea) shared by Eurasia and North America (i.e., by Russia and the United States). Westwards it merges into the Barents Shelf of the Barents Sea. 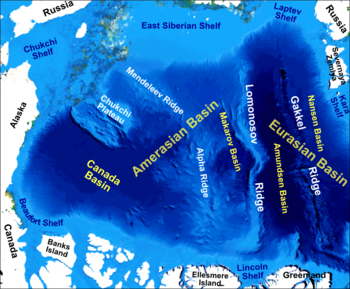 According to the split of the high Arctic by the Lomonosov mid-ocean ridge into the Eurasian Basin and Amerasian Basin, the Siberian Shelf is split between the Eurasian Shelf and the Amerasian Shelf. The Siberian Shelf is the habitat for numerous flora and fauna. Notably the Polar bear is found through much of the shelf, including the Barents Sea and Chukchi Sea. This page was last edited on 12 December 2016, at 04:29 (UTC).